Abigail D’Amore, our CEO, tackles the range of myths that have grown around Musical Futures. Musical Futures isn’t a scheme of work. Musical Futures is not a fully funded programme. Musical Futures is not a ‘resource’. 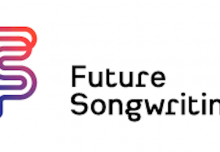 Musical Futures is not ‘That Rock and Pop Project’. So why do these myths exist, do they matter, and what actually is Musical Futures? Musical Futures grew out of an action research project funded by The Paul Hamlyn Foundation to explore the disconnect between the way students experienced music in school, and how motivated and engaged they were in their own time. It was an attempt to bridge the gap between the various realms of music making – formal, informal and non-formal – and to create sustainable and replicable approaches to music learning that could be accessed and delivered by any teacher or practitioner, in any teaching and learning context. Quite a broad brief. But a key directive behind the original Musical Futures development was to draw out and make sustainable innovation and good practice from the ground-up, not parachute in a top-down short term initiative. It was developed with classroom and peripatetic teachers, music services, universities, and most critically the young people themselves. 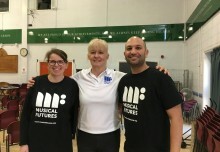 Musical Futures became an approach to the teaching and learning of music, that enabled inclusive, relevant and accessible music participation for all students – the many not the few. As it has grown from the grassroots, it is ‘owned’ as a classroom approach by thousands of teachers – from Birmingham to Brisbane to Brazil – who are able to take the approaches and adapt and adopt them into their own context. What does Musical Futures mean for the classroom? Musical Futures brings non-formal teaching and informal learning into the more formal music classroom. Non-formal teaching – Skill acquisition gained through practical application, teacher as musical leader, in a setting such as a classroom or community context. For example, classroom workshopping and whole class performance. Musical Futures is underpinned by clear pedagogical principles, based on the way that popular musicians learn. Time-pressed teachers are often looking for a scheme of work, particularly on a Sunday afternoon! While Musical Futures provides a range of resources to support day-to-day classroom teaching, it is more than just a quick download. 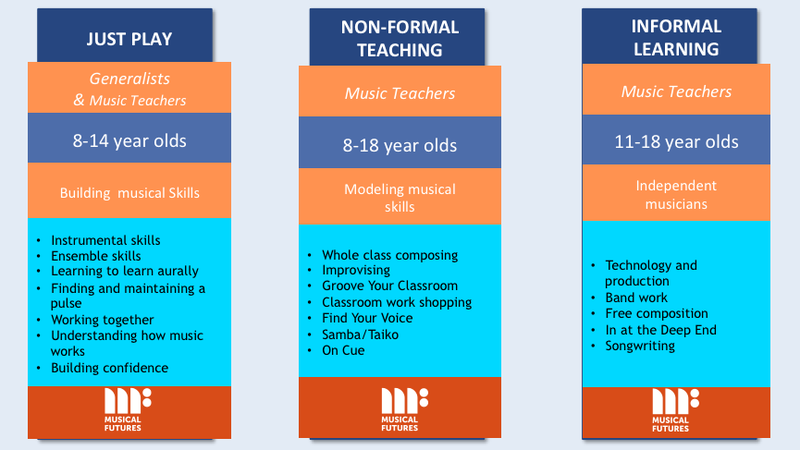 Musical Futures encourages teachers and practitioners to reflect and consider their own practice, making it more student-directed, relevant and engaging, or to provide a catalyst for change for a new direction in music teaching. And of course for many, this is nothing new. Due to the amount of academic research carried out on Musical Futures demonstrating the impact, it provides a useful validation for a particular teaching approach. The ‘Rock and Pop project’ label is partly fair. One of the key starting points for Musical Futures is that students co-create the content, often starting with music that they like, identify with, and are encultured in. For many this does mean mainstream rock and pop. But lift the lid on a Musical Futures lesson in 100 different schools and you will hear a mélange of musical styles and genres from a diverse range of musical cultures. The Musical Futures professional development programme is more than just a one-off training day. It has been crafted over many years – by teachers for teachers – to deeply explore and examine the values, principles and approaches to bringing informal learning and non-formal teaching into classrooms. Musical Futures training puts teachers in the positions of their learners, and enables them to directly experience the approaches. 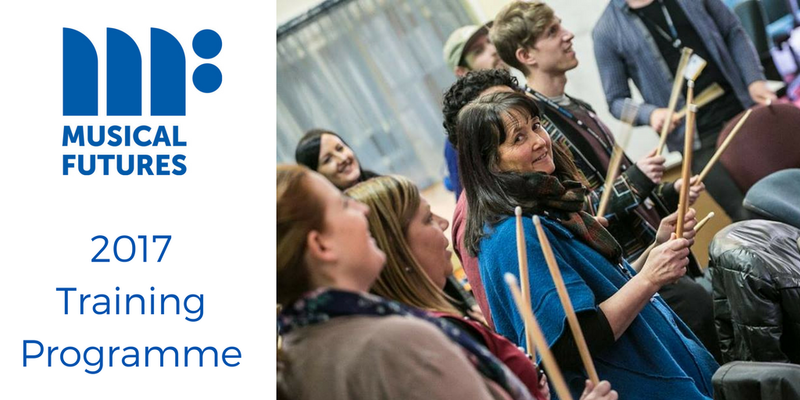 Professional development remains a critical aspect of Musical Futures output, for unpicking and sharing the approaches, and for continuing to build a network of teachers and practitioners looking for innovation and to refresh their practice. Is Musical Futures still a Paul Hamlyn Foundation project? No. The Paul Hamlyn Foundation stopped fully funding Musical Futures in 2013, providing a transition grant to turn Musical Futures into a not-for-profit organisation. This happened in 2014. Musical Futures now operates a mixed model of income generation with some grant funding, income generated from training and resource sales, and sponsorship and donations. All of the original Musical Futures material, publications and resources around informal learning and non-formal teaching (around 200 resources) are still freely available and open source for anybody to access. Any new material developed (and our training courses) do have a small cost attached. Musical Futures subsidises this through grant funding as heavily as possible, but for us to keep our network and ongoing development programme continuing charges now need to be made. As an organisation, Musical Futures remains committed to working with teachers to keep music alive in our schools and to nurture the creative talent of tomorrow.